Tuscan Traveler escaped the extreme weather of Florence in November by going south of the equator to Santiago, Chile, to visit warm friends and hot weather. There we were urged by on by our good friend, Gerardo, to visit an only-in-Santiago, have-to-try-it-once, eatery for the soon-to-be-famous Terremoto Cocktail. With the proviso that this place was too dangerous to visit at night, we ventured forth. I tasted (but did not drink more than a educating sip) a Terremoto at La Piojera, a similar, but newer version of El Hoyo. Former Chilean President Arturo Alessandri first coined the name “La Piojera” in 1922, when he was invited to visit this bar by the owner. 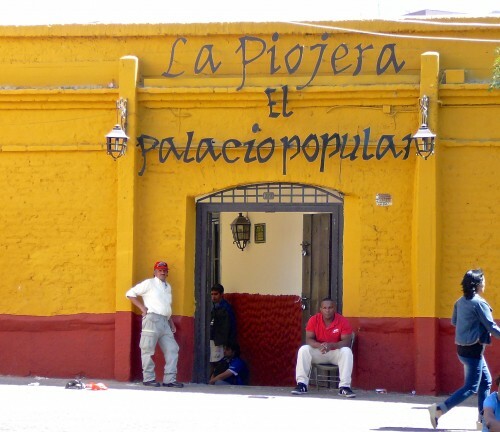 When he walked into the place, full of working-class men, he exclaimed, “What is this place, a flea house?” Thus the name “La Piojera” (where fleas live) was born. La Piojera, created by Don Carlos Benedetti Pini in 1916, still belongs to the same family, after being saved from developers by protests from its loyal clientele (including presidents and poets). The significance of this locale can be seen on its graffiti-covered walls, which leaves you in awe of the cultural ambience, rather than aesthetics at this cramped, loud drinking establishment. At La Piojera they add the Italian liquor, Fernet Branca, to their Terremoto – the secret ingredient that cuts the sweetness and darkens the pipeño. (Take note: Terremotos go straight to your head. While they go down smooth (once you get past the shock of the sweet, sweet, sweet taste), they carry the name “terremoto” for a reason.) If you still feel up for more drinking after a Terremoto, try a Replica (“aftershock”). This second round is filled with all the Terremoto goodness, but at half the alcohol. Or try the Maremoto (“Tsunami”) with mint in place of the Frenet Branca, but still with a topping of pineapple ice cream. But what to eat with such a specialty drink? Wine pairing with pipeño is difficult. Add the pineapple ice cream and the problem is doubled. It must be something sufficiently fatty, the kind of dish you would not mind eating before you lose all sense of time and space from all the sweet alcohol. The best advice: a pork leg – not a shank, a leg. Boiled. 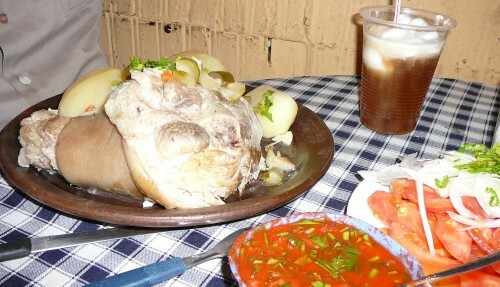 With boiled potatoes and a side of Chilean salad – tomatoes and onions. It turns out we were in “good” company. 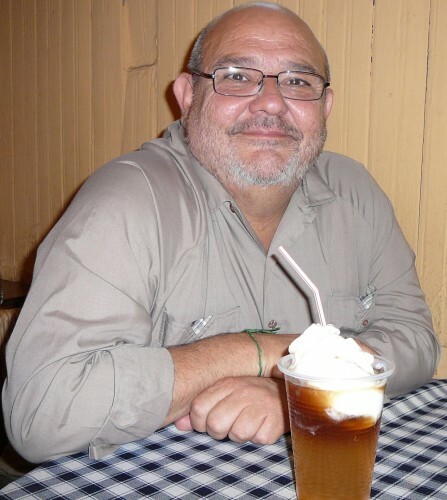 Although he did not choose to grace La Piojera, Anthony Bourdain drank his share of Terremoto Cocktails at El Hoyo and paired it with similarly high fat foods. We are not on film, but he is. View here. 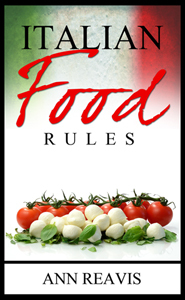 I’ve been writing about Italian Food Rules for some time now. See here, here, and here. Experiencing a soon-to-be-famous culinary creation of a relatively young country like Chile, makes me appreciate the rationality behind those rules all the more.